December 4, 1908 -- Runner Dorando Pietri, whose unforgettably dramatic physical breakdown in the last few yards of the 1908 Olympics marathon made him a subject of worldwide fascination, is going to race fellow marathon champion John Longboat, a Canadian phenom, at Madison Square Garden. He recently did the same with John Hayes, beating him handily. [Although this book comes pretty far afield from Stripper's Guide's subject of newspaper comics, I have found it a very interesting read for its explanation of the evolution of the 'illustrated newspaper'. Of course the evolutionary tree of that invention will eventually, in the 1890s, finally offer the particular fruit of which we like to partake, the comic strip. Thus, it serves as the backstory to our own particular source of fascination, and as such, is of interest to those of us with a desire to know its primordial origins. The author is enamored of very loooong quotes from his source material. I considered clipping a lot of it out, since we are interested more in the press itself than the subjects it was printing. However, doing so would have resulted in a rather choppy narrative, and besides, some of it is quite interesting. If the long quotes aren't interesting to you, be assured that you won't miss out on anything if you skim through looking for the bits about the press itself. Please note that since this book is British and written in the 19th century (published 1885), I felt it not unreasonable to take the liberty of updating occasional quaint spellings and archaic terms. British spelling has been left alone. The inherent love of pictorial representation in all races of men and in every age is manifest by the frequent attempts made to depict natural objects, under the most unfavourable circumstances and with the slenderest means. The rude drawing scratched on the smooth bone of an animal by the cave-dweller of prehistoric times, the painted rocks of the Mexican forests, and the cave-paintings of the bushmen, are all evidences of this deeply-rooted passion. The child of civilised life looks with delight on his picture-book long before he can make out the letters of the alphabet, and the untutored Eskimo treasures the stray number of an illustrated newspaper left in his hut by the crew of some whaling ship, though he cannot understand one word of the printed page. But the pictures speak a universal language, which requires no teaching to comprehend. When the printing press came into use this love of pictures had a wide field for development. Some of the first books printed in England were illustrated with woodcuts, and many of the tracts, or ‘news-books,’ which preceded regular newspapers, were adorned with rude engravings. It mattered not how graphic was the pen, its work was deemed incomplete without the aid of the pencil. It often happened that the pen was none the better for the fellowship, but the public taste was not fastidious, and the work sufficed for the occasion. In tracing the origin and progress of pictorial journalism we shall find in ‘the abstracts and brief chronicles of the time’ many curious illustrations of contemporary history. The subject is not without interest now that the illustrated newspaper has become a prominent feature in the journalism of every country. The development of the newspaper press and its unrestricted use as the exponent of public opinion is one of the most interesting signs of modern progress. When we consider the liberty of thought and action that prevails in our own day, it is difficult to believe that our forefathers were liable to the pillory and other degrading punishments when they ventured to publish their opinions without first obtaining the sanction of the ruling powers. We are accustomed to the daily exercise of the right which cost Prynne his ears and brought fines and imprisonment on Defoe. Newspapers have become almost as necessary to our daily life as bread itself. The mind demands its breakfast as well as the body; and to many a busy man the loss of his morning paper would be as great a deprivation as the want of his usual mornng meal. In London, and in all our great centres of population, the newspaper has become the unfailing accompaniment of the city man’s journey to business. At the railway stations journals of every kind tempt the loitering passenger, while the illustrated papers appeal to him in a language of their own. Whether in the railway carriage, the omnibus, or the steam-boat, the newspaper is eagerly conned, and its contents form the food of conversation. 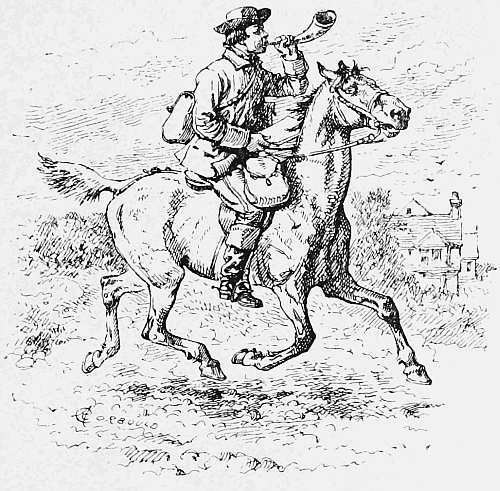 Most of these newspapers are cast aside at the end of the twenty minutes’ or half hour’s journey; and then, at second hand, they amuse the leisure moments of the railway porter, or, better still, they are collected together, and perhaps serve to solace the sick poor during many lingering hours in hospitals and refuges. Day by day the demand is made, and the supply is ready. The printing-machine never sleeps and is never tired. Its voice is one of the voices of the night—most unmusical, yet with a mysterious meaning. The daily newspaper, so potent in diffusing the light of knowledge, is itself the offspring of darkness. The busy brains and active fingers which create it turn night into day in the execution of their quickly recurring tasks, and with unflagging energy they labour on, that the slumbering world may be properly amused and instructed when it wakes. The intelligent foreigner who happens to reach our southern coast on a Monday morning in summer or autumn, and travels to London by one of the early trains, is astonished, when the train stops, to see most of the gentlemen rush from the carriages and surround a small boy, whom they appear to hustle and threaten with violent gesticulations. 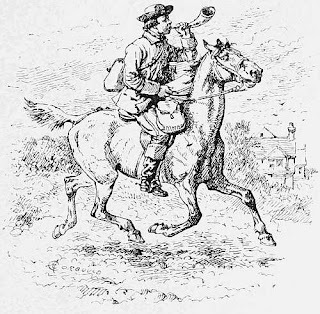 The boy appears to buy off the hostility of his assailants by dealing out to each a paper, which he takes from a large bundle under his arm, and with which the appeased passenger returns to his carriage. Cries of ‘Times! Daily News! Telegraph! Standard!—Here, give us one—anything!’ reach the ears of the wondering stranger, who beholds the boy at length take refuge in an empty railway carriage on the opposite side of the platform, and from that place of vantage he continues to deal out the mysterious papers. After a time the intelligent foreigner learns that these are the London papers of that morning, which are sent out to meet the trains, and are eagerly bought by the gentlemen who have been spending from Saturday to Monday at the seaside, and, having fasted from all newspapers during that time, they are now of course famishing for news. Such is their eagerness that politics are thrown to the winds. The Conservative will put up with a Liberal newspaper rather than have none at all; and he whose ill luck or inertness has left him without the coveted sheet is glad to borrow of his neighbour, that he may not be walking in the darkness of ignorance when he arrives at his place of business. As the train moves off, the intelligent foreigner, if he thrusts his head out of the carriage window, may behold in the distance the newsboy pensively counting his gains and endeavouring to make his receipts tally with the number of papers that have vanished. When we consider the immense amount of printed matter that is published every day by the newspapers, we cannot but wonder at the public appetite. And this appetite is fed from one year to another upon a diet that is only varied when there occurs a war, a revolution, an unusually disastrous shipwreck, or a murder of uncommon atrocity. Then the monotony of ordinary life gives place to the temporary excitement. There is a run upon the newspapers, which are as susceptible as barometers, and rise or fall according to the state of public feeling. The calamities of nations and the misfortunes of individuals are sources of profit and prosperity to the newspaper. It was a happy idea to gather together the principal events of the week, to illustrate them with authentic pictures, and place them before the public in the form of a pictorial newspaper. 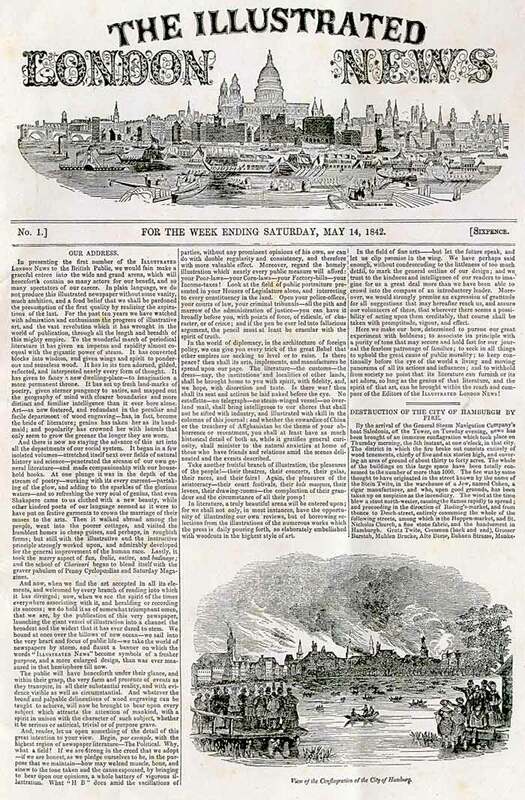 Considering the great cost of production, and the restrictions under which newspapers lay at that time, to say nothing of the difficulty of bringing out news with appropriate illustrations, so that both should be fresh, the Illustrated London News was a bold undertaking. Like most things that are successful, it soon had many imitators, and there are now few large cities in the civilised world that have not their illustrated newspapers. But the full development of illustrated journalism was immediately preceded by many significant symptoms. 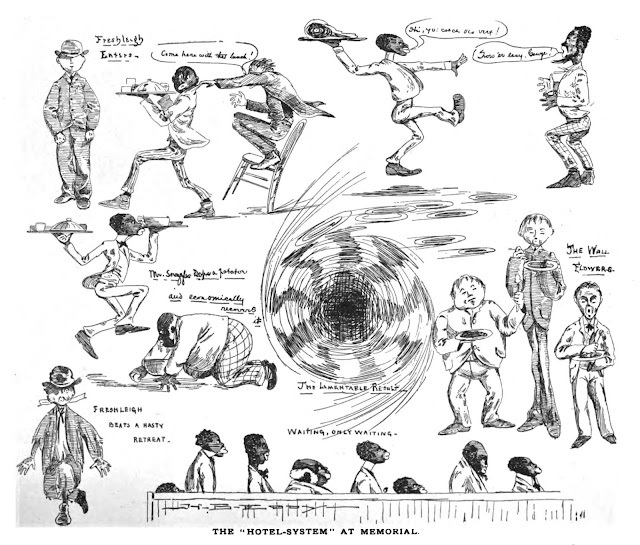 Several of the then existing newspapers, on the occurrence of any unusual or interesting event, introduced into their pages rough woodcut illustrations. A great fire—a remarkable murder—a fatal balloon ascent—these were the subjects seized upon at the moment to satisfy the public craving for illustrated news. All this seems to have been the working of an impulse or instinct which existed even before the days of newspapers; for, as I shall presently show, attempts were made to illustrate the news of the hour in tracts or ‘news-books’ before the beginning of regular newspapers in England. 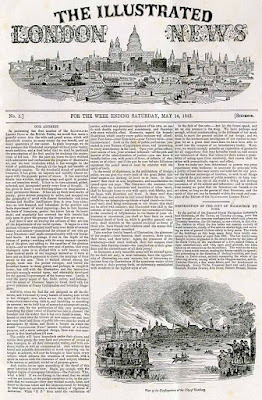 The idea of illustrated journalism may be traced from the earliest years of the seventeenth century to 1842, the date of the first number of the Illustrated London News. The art of wood-engraving had fallen very low in the seventeenth century, and the illustrations to be found in early newspapers are mostly of a very rude description; but they show the existence of a germ which eventually grew into full and flourishing life. The English newspaper, like many other great inventions, was a thing of gradual growth. The news that was sung or recited by wandering ballad-singers at the village cross, or in the courtyard of the squire’s mansion, and the written newsletter furnished to the wealthy aristocracy, were the precursors of the early news-books and the periodical sheets of news. As the art of printing extended, many of the productions of the press assumed the character of news to attract readers. Sermons, satires, and travels, were all put forward under the name of news, and sometimes a single grain of truth was deemed sufficient to leaven a whole bushel of fiction. Most of these publications were small tracts, and published at irregular intervals. Some of them were adorned with engravings on the title-pages, which show that even at this early period the authors or printers of these papers were imbued with the pictorial spirit. The idea of illustrating current events had already taken root, and we find examples of it long before the establishment of regular newspapers. The earliest form of the newspaper is known to have come into existence during times of war and tumult, and it was for a long time believed that the first English newspaper was brought forth under similar circumstances. But when the English Mercurie of 1588 was proved to be a forgery, the enthusiast in newspaper history received a heavy blow and sad discouragement. It seemed so highly probable, when this country was threatened with the descent of the Spanish Armada, that something like a newspaper might have sprung into existence, that people were only too ready to adopt the imposture. When the whole nation was greatly excited and anxious to learn something about the reality of their danger, nothing was more natural than for the sagacious minister of Queen Elizabeth to appeal to the people through the printing press, and by its means endeavour to calm the public mind by circulating printed sheets of intelligence, ‘for the contradiction of false reports.’ But we were compelled to admit that Lord Burleigh had missed his opportunity, and neglected to use the most powerful means for exciting the patriotism or allaying the fears of his countrymen. The author of this remarkable imposition showed great skill and acuteness in constructing his false newspaper, and fixing the date of its supposed publication. The forgery has been attributed to Lord Hardwick; but what were his motives it is difficult to understand. Unlike Chatterton and Ireland, he never brought his imposture before the world, and if he intended it merely for an antiquarian jeu-d’esprit he had the enjoyment of the joke entirely to himself. The abolition of the Star Chamber, in 1641, was an important event for the press of this country. The so-called newspapers then began to print English news and discuss home affairs, no longer dreading the fines, imprisonments, and mutilations, that had been so liberally dispensed by that obnoxious tribunal. There was not, however, any considerable increase in the number of newspapers until the Civil War reached its height. During that remarkable contest many hundreds of tracts and newspapers were published, some of them numbered consecutively and published at regular intervals; but the great majority bore no continuous title, and treated of one subject only. During the reigns of Charles II and James II, the press was more or less under a censorship, from which it was not emancipated till the seventh year of William III. Lord Macaulay dates the commencement of English newspapers from this period, when a great many new journals made their appearance. They included political news amongst their contents; and they more nearly resembled in character, but not in appearance, what we now understand by a newspaper than anything that had preceded them. This press revival was not accompanied by any corresponding activity in the direction of pictorial illustration. Art of every kind was in a low condition in England at this time. Even if the art of popular illustration had been better understood, the means of production were exceedingly limited. Newspapers multiplied greatly, but illustrated journalism had to struggle with difficulties, and its existence was only made known by the occasional appearance of a rough woodcut or an indifferent copper-plate. Henry Brevoort Eddy was born in New York on September 16, 1872, according to Who’s Who in America 1903–1905. His parents were Ulysses D. Eddy and Jane Brevoort. In the 1880 U.S. Federal Census, Eddy, the oldest of five children, resided in Rye, New York. His father was involved with the cotton market. Who’s Who said Eddy’s preparatory education was at St. Paul’s School in Concord, New Hampshire, from 1884 to 1890. Eddy graduated from Harvard in 1894. …Mr. Eddy is but twenty-three years of age, and while he has “made pictures” as long as he can remember, his career as an artist can be said to have commenced only a year ago. Shortly after graduating from Harvard, where he distinguished himself by his work as president of the Harvard Lampoon, he came to New York, where his professional debut as artist and reporter was made to the readers of The Sun. A student of human nature, he adds a touch of cosmopolitan broadness to his own individuality, and always succeeds in catching the essential and characteristic point; in this there is occasionally an inclination to caricature, at which he is incomparable. …Mr. Eddy has never studied at art school or under instructor, and he doubtless dislikes conventional technique or finish of execution; and, after all, what does technique or finish amount to without thought or idea? …Mr. Eddy admitted that he thought the poster artist of the future would be more serious, no doubt, and better men will devote their attention to this branch of art, which at present is understood only by a few. …Mr Eddy’s versatility extends to music, and when not sketching or playing golf, he is busy at the piano, and his friends say he is quite a virtuoso. However, he puts art first and foremost…. The Copy-Maker (1897) and He, She and They (1899) were two books illustrated by Eddy. Who’s Who said Eddy had been a newspaper artist since 1898 and was on the New York Journal staff. Eddy was counted in his parents household during the 1900 census. They lived in Oyster Bay, New York. Eddy’s occupation was an artist, who also illustrated many sheet music covers. In 1910, Eddy and his wife, Marguerite, resided in Manhattan, New York City at 54 West 39th Street. The newspaper artist had been married a year according to the census. The 1915 New York state census recorded the couple in Rye on the Brevoort Farm. Eddy worked as an editor and artist. 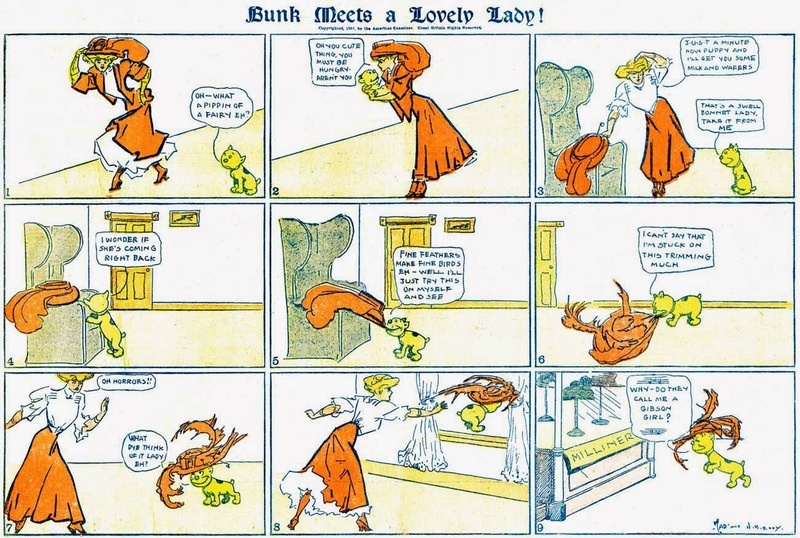 American Newspaper Comics (2012) said Eddy drew the final installment of Tad’s series, And His Name Is Bunk, which appeared September 1, 1907. Eddy signed his World War I draft card September 12, 1918. The card said he was an artist editor on the Sunday American. His description was medium height, stout build with blue eyes and brown hair. The Utica Herald-Dispatch (New York), May 3, 1919, reported on Eddy’s upcoming painting exhibition. There is now intransit from New York to Utica a collection of landscape paintings by Henry B. Eddy, which are to be shown as a “one man” group exhibition at the Utica Public Library. The pictures will be hung us soon as received, in order that the exhibit may be opened May 10, as announced, to remain until the end of June. The painter, whose studio is in the still unspoiled hill country of North Central New Jersey, near Weetfield, is one of the young men trained at the Art Students League under the influence of the famous trio. Kenyon Cox, Douglass Volk and John T. Twatchnian. 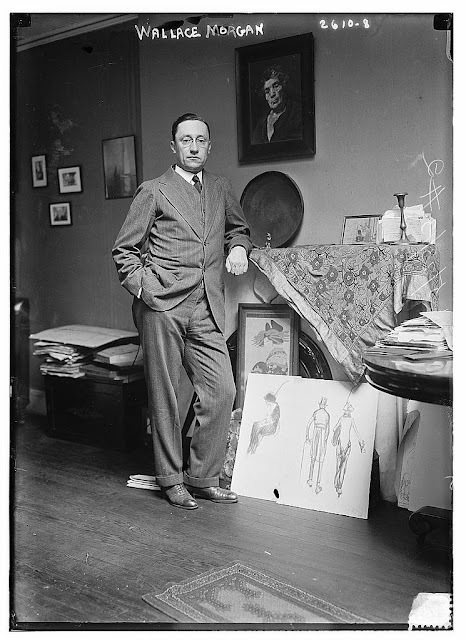 Later he studied under that master of modern decorative figure painting, Mucha, and with George Elmer Browne, at the latter’s summer haunt near Provincetown. Mass. From this quaint and lovely center of New England life in the old days come some of the most interesting of last season’s output of Mr. Eddy’s work. Of these some have been shown already at the Salmagundi Club of New York, of which the artist is a member, some at the recent exhibition and some at the Thumb Box Show, just closed. But beside the Provincetown pictures of the old time town, its wandering lanes and staid white walled shingle-roofed houses, and the yellow browns and russets of sand dudes and coast, are scenes from Maine and the Adirondacks. from New Jersey, Delaware and Virginia. From the Maine shore the landscape is of the rocks and sea at the end of Squirrel Island—from the Adirondacks the dark freen pines that overshadow Big Moose Lake, and the shores of Dart’s Lake with Slide-Off Mountain looming in the distance. The New Jersey pictures are from the Watchung Mountains, glimpses of tumbling streams flowing under old red bridges, of yellow hillside homes half hidden in the forest, of gray-toned distances, and of the early springtime near Echo Lake. The hill country along the Delaware River is shown in the canvases from the State of peaches and Virginia appears in the country of Washington’s youth the woods and rocks near Great Falls. “The last not least in love” are the thumb box sketches, of which a number are included in this representative and altogether interesting showing of one man’s part in to-day’s American landscape art. Eddy passed away July 29, 1935, in Rye, New York. His death was reported the following day in The New York Times. 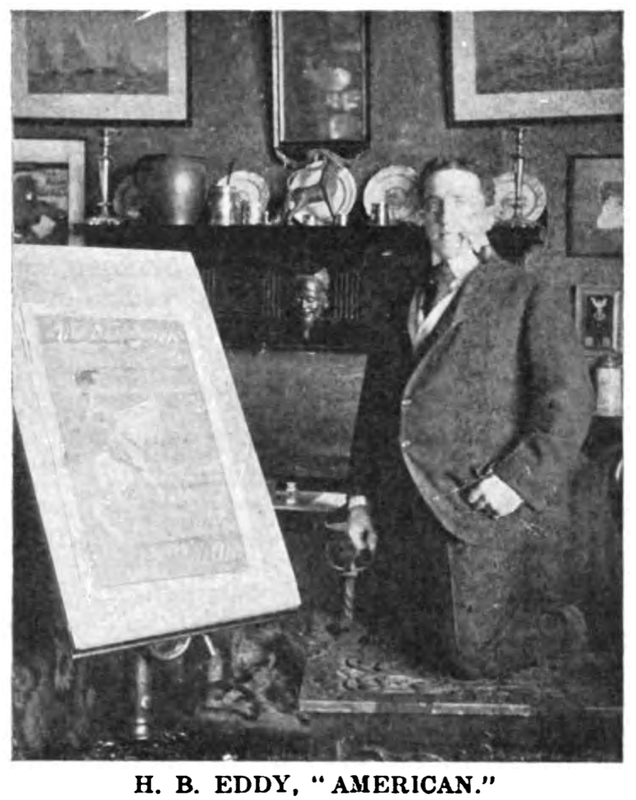 Henry Brevoort Eddy, an editor and cartoonist on the staff of The American Weekly Magazine and member of an old New York family, died suddenly of a heart attack here tonight at his residence, Brevoort Farm. He was in his 64th year. A native of New York, Mr. Eddy was the son of the late Ulysses Doubleday Eddy and the former Jane Brevoort. In 1894 he was graduated from Harvard University, where he was an editor of The Harvard Lampoon. One of his first newspaper jobs was with The New York Sun. Afterwards he worked on other newspapers, including The New York American, besides illustrating several books. Mr. Eddy’s wife, the former Marjorie Barre of Montreal, died last February. Surviving are two sisters, Mrs. Reginald Prescott Walden and Mrs. Howard Talbot Walden; four nieces, Mrs. Charles J.V. Murphy, Mrs. Harold L. Gault, Mrs. C. Walden Cory and Mrs. Garrison Rushmore Corwin, and three nephews, Howard Talbot Walden Jr., Brevoort Walden and Ulysses Doubleday Walden. All are from Rye. Funeral services will be held at 2:30 P,M. on Wednesday at St. Thomas Episcopal Church Mamaroneck, N.Y. Burial will be in Woodlawn Cemetery. In the early 1930s Russell Patterson was the darling of the King Features Syndicate magazine cover editor, and he churned out the romantic pablum like a demon. 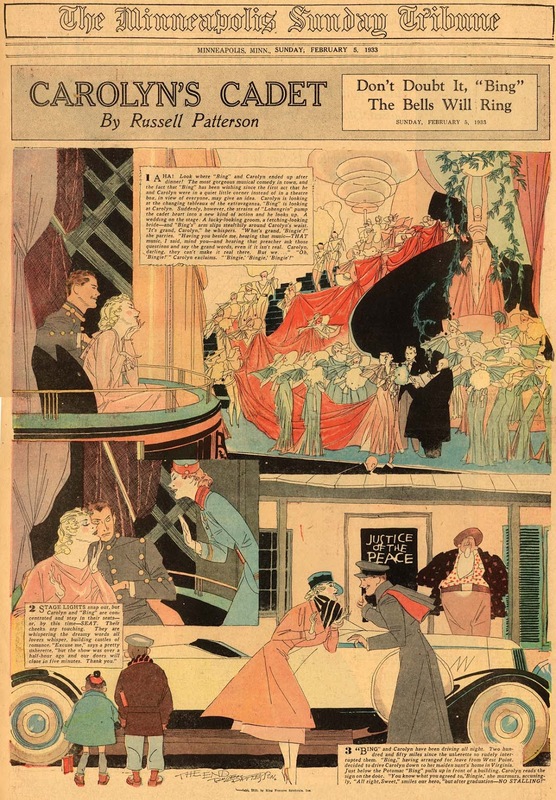 Here is Carolyn's Cadet, in which another art deco romance blossoms, this time involving a dashing young army (?) 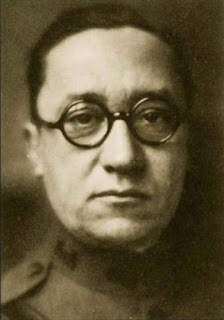 cadet. This would be one of his last magazine cover series before he returned to the fold in the early 1940s. The Carolyn's Cadet series ran from December 4 1932 to February 5 1933. Wallace Morgan was born in New York City on July 11, 1873, according to the National Cyclopædia of American Biography (1950). His parents were William Penn Morgan and Frances Ann Wallace. Morgan’s father was an artist who moved his family to Albany, becoming a professor of art. Morgan attended schools in New York City and Albany. The 1880 U.S. Federal Census recorded Morgan, his parents, older sister, Elizabeth, and maternal grandmother, Eliza, in Albany, New York. They resided on Spring Street. [Morgan] had chosen to take up the profession of art rather than to enter college. The National Academy was then at Twenty-third street, and young Morgan began his studies there with the intention of becoming a painter or a mural decorator, the latter field holding a strong attraction for him. He had the illustrator’s point of view, however, and soon found his greatest interest to lie in that in that direction. While studying, an opportunity came for him to fill in the place of a friend who had been a part-time artist on The Sun, and he accepted the opening eagerly but still continued his studies at the Academy, which meant working day and night. …A year later, Morgan was called to the regular staff of The Herald, but he continued to devote some of his time to study at the National Academy until he felt competent to gain his further progress by experience. His work quickly became popular. He possessed in a high degree the ability to inject life and action into an illustration, and he could convey to the average newspaper reader exactly the atmosphere of the scene which he pictured. His life was full of incident and adventure, he sometimes receiving assignments that lasted a month or six weeks and upon which he had to hold himself in readiness to start at a moment’s notice. A 1891 New York City directory listed artist Morgan at 933 Park Avenue. Morgan’s listing in the 1897 Albany city directory said he boarded at 293 Madison Avenue. In the 1900 census, the Morgan family were New York City Manhattanites at 206 West 133rd Street. Morgan’s occupation was artist. National Cyclopædia said Morgan, in 1898, began an eleven-year stint as staff artist for the New York Telegram and Herald. American Newspaper Comics (2012) said Morgan and writer Carolyn Wells produced Fluffy Ruffles, from February 3, 1907 to January 3, 1909, for the New York Herald which later published their work in a book. Morgan’s next series for the Herald was Cynthianna Blythe which was written by Harry Grant Dart and ran during 1909 into 1910. Morgan drew the March 27, 1910 Sunday panel, The Widow Wise, which featured illustrators William H. Loomis, E.V. Nadberny, Modest Stein, James Montgomery Flagg, Prince Pierre Troubetzkoy and Paul West. 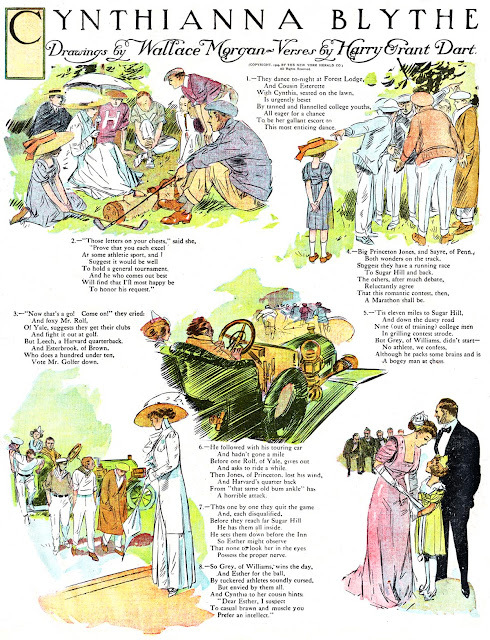 Morgan’s artwork appeared in many magazines including the Scrap Book, October 1907; Cosmopolitan Magazine, February 1910; Collier’s, October 20, 1917; and McClure’s, May 1921. In 1910, Morgan, his sister and a servant were at 40 West 93rd Street in Manhattan. The 1915 New York state census recorded the siblings in Manhattan at 312 West 93rd Street. 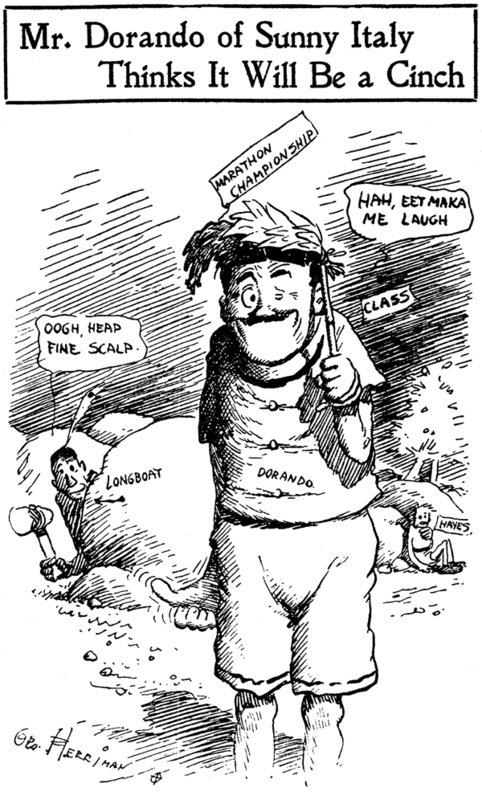 Morgan was one of ten cartoonists pictured in the New York Sun, June 8, 1913. Morgan and Julian Street traveled twice across America. The result was the books Abroad at Home (1914) and American Adventures (1917). During World War I, Morgan served overseas from March 14, 1918 to April 1, 1919. The New York Times, April 25, 1948, said he was with the American Expeditionary Force in France. Morgan and several artists answered General Pershing’s call to produce a pictorial history of the conflict. Morgan depicted the fighting in Chateau Thierry and Belleau Wood. Morgan was discharged May 7, 1919. Morgan illustrated wartime stories for McClure’s and Everybody’s Magazine. Morgan was counted twice in the 1920 census. He and Elizabeth continued to reside at 312 West 93rd Street. Morgan’s studio was at 6 East 30th Street. A 1922 New York City directory and passenger list recorded Morgan’s address as 61 East 86th Street. Some time later, Morgan’s new residence was 25 East 86th Street. The same address was in the 1930 census. Brother and sister had moved again, according to the 1940 census, to 162 East 80th Street. Morgan was a contributor to Life, the New Yorker and the Rotarian magazines. Late in his career, Morgan did the comics adaptation of Cluny Brown for the Book-of-the-Month Club series which was distributed by King Features in 1945. Morgan passed away April 24, 1948, in his New York City home at 162 East 80th Street. The cause was a heart attack as reported the following day in the New York Times. He was survived by his sister. Once upon a time there were two brothers. They both had enormous heads and doughy round bodies, which suited them just fine. Both brothers were brought up to be faultlessly cheery, to always look on the bright side of life, and to turn the other cheek. Sadly, the world took advantage of their positive attitudes and seemed to throw an endless series of obstacles, pointless meanness, odd events, and just plain bad luck in their way. It was very hard for the brothers, but they persevered. The older brother, named Clyde, was ten years the senior. When he was old enough to fend for himself in the world, he got a job at the Times-Mirror Syndicate through his good friend, cartoonist Bill Brewer. The syndicate welcomed Clyde with open arms, because Brewer told them of his strangely uncharmed life, and Brewer promised to chronicle his misfortunes in a daily comic strip. This may seem a bit mercenary, but the syndicate and Bill Brewer knew that Clyde couldn't get any other sort of work, and they felt that he was entitled to at least make a living from his strange life. But Clyde's bad luck spilled over into his job. After his debut on the comics page on April 3 1961, it became evident that the story of his life was just not the fodder for a successful comic strip, at least in the opinions of the nation's newspaper editors. Thus, in yet another cruel turn for Clyde, his strip was cancelled after little more than three months, nowhere near enough time to find an audience. The strip came to an end on July 24. Despite his upbringing to have a relentlessly positive attitude, Clyde could not take this last horrific turn of events. He disappeared and was never heard from again. Some say he drank himself to death, others say he became a hermit in the Himalayas. No matter what became of him, one thing is certain. He left his little brother alone to fend for himself. But that little brother of his had an even sunnier disposition than Clyde, and he refused to say die in the face of everything that happened to him. Ten years after Clyde disappeared the climate of the country was different -- much less buttoned-down and more open-minded. People were now better able to sympathize with a doughy little unlucky fellow with a massive head. When, strangely enough, another cartoonist came into the picture, the two got together and decided to try the same thing that Clyde and Bill Brewer attempted a decade earlier. And lo and behold, they were right that a new day had dawned, and the strip was a huge success! Although Clyde's younger brother was still beset with an awfully unlucky life, he did so with millions of people watching him, feeling sorry for him, and making him very wealthy. But there is one thing that younger brother cannot stand, and that's to talk about his beloved and much-missed brother Clyde. And that's why in little brother Ziggy's comic strip you will never ever hear Clyde's name mentioned. Thank you for your interest and report of Clyde. We appreciate being remembered. I'd like to send you my bio and a few images so you know I did live. Hi Bill -- Great to hear from you! I'd love to know more about how Clyde came to be, and its unfortunately short life. You can communicate with me via email, at strippersguide@gmail.com. Watching old videos of the Groucho Marx show and saw Bill Brewer - and his mention of the new cartoon, “Clyde”. So interesting too see Bill at what appears to be the start of his career!